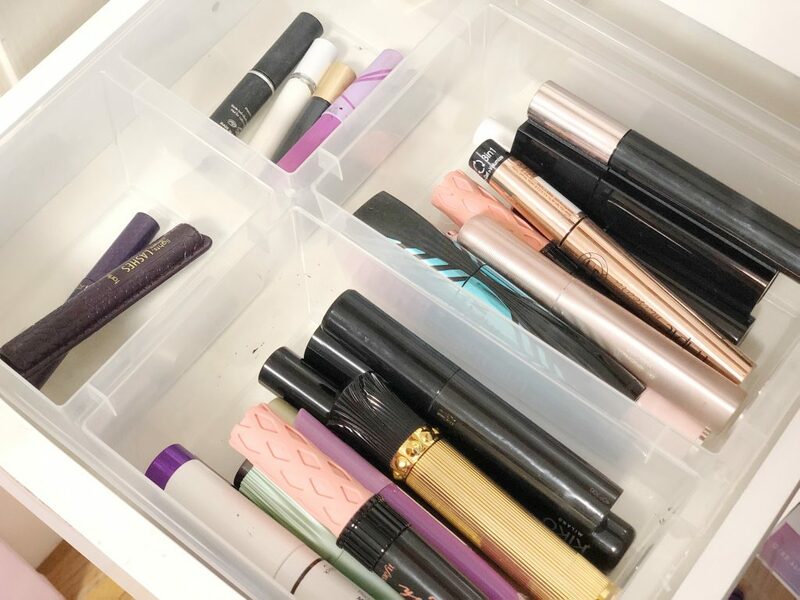 Today’s post is all about makeup and beauty storage! I’ve spent a few years perfecting how to keep it all organized. Before we moved to the suburbs we had an apartment in downtown NYC. 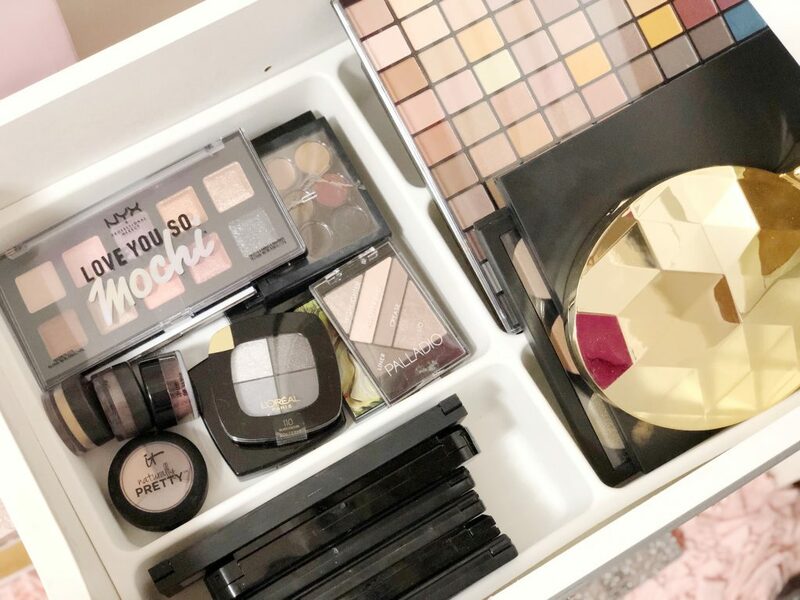 Even though it was nicely sized, once I became an influencer the products started pouring in and keeping it all organized became overwhelming for sure. But even before then I was into beauty and makeup and right before becoming and influencer I started collecting a lot more products. Prior to that I had a simple one drawer vanity, with an acrylic drawer organizer on top. There were also times like in college and post college where I had one huge bag of makeup and kept everything I owned in there. I used to do my makeup on the floor in front of our floor length mirror (which I did for years and liked) and would just dump out the bag on the floor and put items back as I used them. I guess I’m weird like that lol. I also used to sit on the floor in front of the mirror to dry and style my hair. I guess it was more comfortable. Currently, I’ve been perfecting how I keep it all together in a way that is convenient and put together. I often get asked what in the world I do with all the PR and samples that companies send me which I think was the biggest challenge when I had more than I knew what to do with (not complaining AT ALL I’m very grateful) When I receive a package I immediately pick through it, and set aside the colors/products I know I want to keep unless it’s skincare and I need to test out a few so I can review it for you guys. Just as an example, if I received a package of foundation with all the shades I’d set aside the ones closest to my skin tone and put the rest aside. I have a large wardrobe it’s the PAX system from IKEA with shelves and drawers where I store all my unused PR. I also donate a lot of things. Local shelters and companies helping women and families get a fresh start can always use beauty tools like hairdryers, makeup and accessories. I do keep a decent collection in the cabinet to use for gifting and giveaways which I have a bunch planned for this year. Eventually I invested in two Alex Drawer Cabinets from IKEA and got a table top to put over it. In our current home, I took the doors off a closet and made a beauty nook. The ALEX system fit perfectly in it so that’s my current situation. 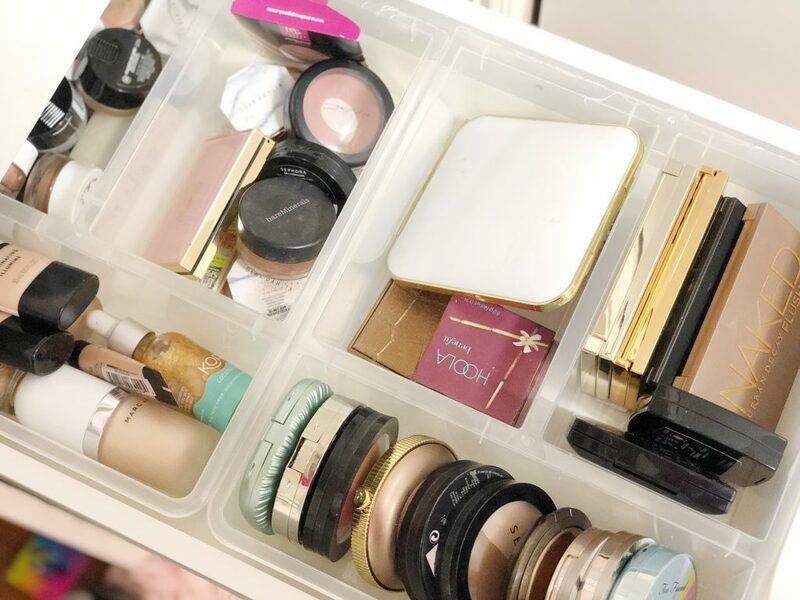 I try not to keep too much on top of the vanity to prevent clutter and keep all the drawers organized, in order by product and the order I put it on so I’m not fiddling around. So with that being said, here’s how I’ve organized everything. I’ll link the products and similar options for you guys. 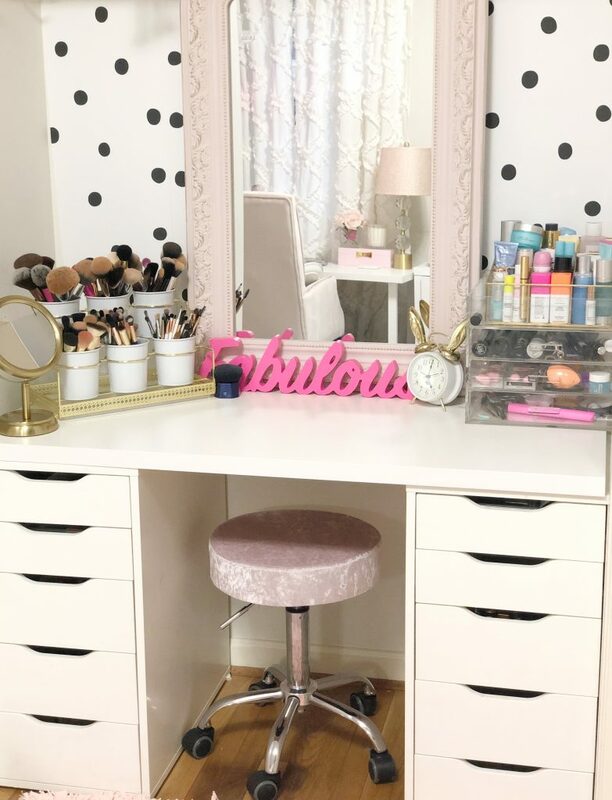 Even if you don’t use IKEA or however you have your set up these tips and products are all very versatile and can accommodate most arrangements so read on! At the end of the post I’ve linked a bunch of other great vanities, mirrors and stools. On top of my vanity, I keep my Mirror, A Small Acrylic Organizer, A Divided Organizer for Skincare and A Holder for My Brushes. 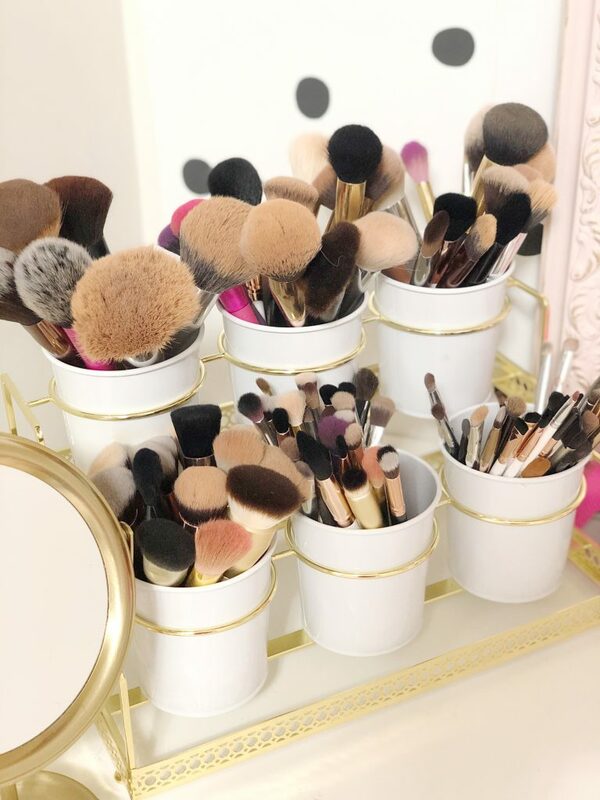 For storing your BRUSHES no matter how many you have, I recommend using open cups/pots/mugs or a divided storage system. I don’t recommend keeping your brushes in a drawer or a bag because it harvests bacteria. Although I’m guilty of this sometimes-keep your brushes clean. I recommend washing them once a week or so. I recently got THIS BRUSH CLEANING SYSTEM and it’s AMAZING. I have a lot of brushes so it takes a little time but it washes them fast and dries them almost instantly so you don’t have to let them sit out forever to dry. And this is the cleaner I use for my brushes and sponges. 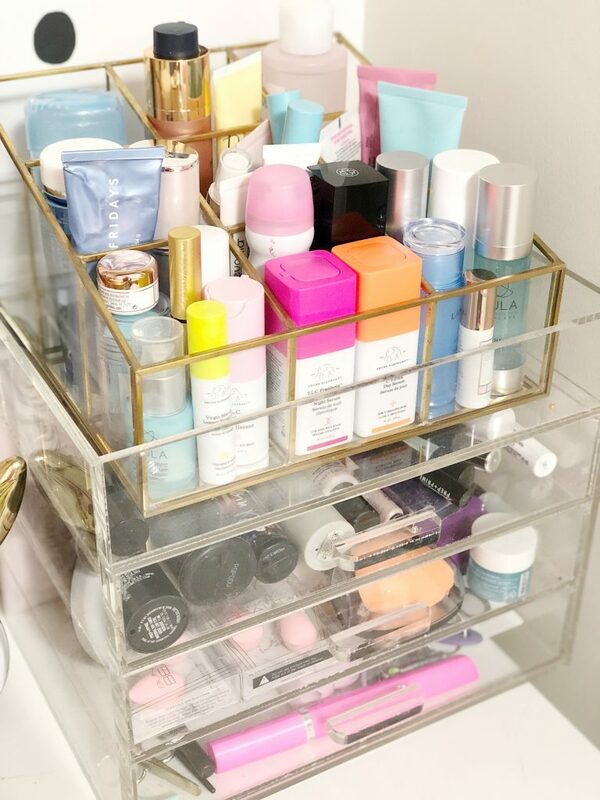 Here are some good products if you like to organize things on top of your vanity. I also keep a magnifying mirror to the side so I can do my brows and things up close. I also keep a folding LED mirror as well which is great for traveling because hotel lighting can be poor. Also on top I keep an acrylic drawer where I keep miscellaneous tools like trimmers and tweezers and small parts for beauty tools. I also store my primers and setting sprays in there as well. Things I use first in my routine. 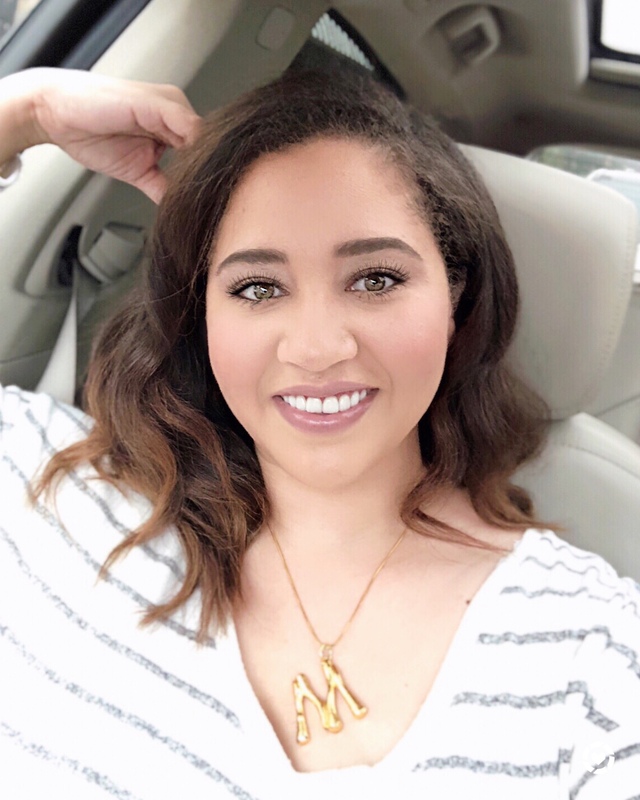 I also recently did a post on my quick and easy makeup routine if you want more info on some of my go-to products for every day. I will say that acrylic storage drawers can be an investment. I’m not sure why acrylic is so expensive but it is. But invest in one and it will last for years. I will also say that storage is something you can repurpose for other things. Sometimes I move things around but storage can be used anywhere: office, kitchen, bathroom etc. So you will get use out of it no matter what. Here are some great acrylic organizers. Now let’s move on to the drawers. As I mentioned before I’m using the ALEX SYSTEM from IKEA. There are also places that make the same exact thing. In the drawers I use organizers so things aren’t all over the place. I got some kitchen drawer organizers also from IKEA that fit inside the ALEX drawers perfectly. I used to have a one drawer vanity from IKEA and I got plastic organizers from there as well. I CUT THEM UP to fit the drawers. I couldn’t find them online but the last time I was at the store I was able to find them and they are only a few bucks. You’ll see in the photo my cutting job wasn’t perfect. I just cut them with a heavy duty pair of scissors and don’t really care that it’s not perfect. Here are the drawers. The system has a few different options as well. There are also several places that make the exact same things. Also you can now buy IKEA on Amazon! Now I am going to show you how I keep everything organized in the drawers. At the end I’ll link all the drawer organizing products. 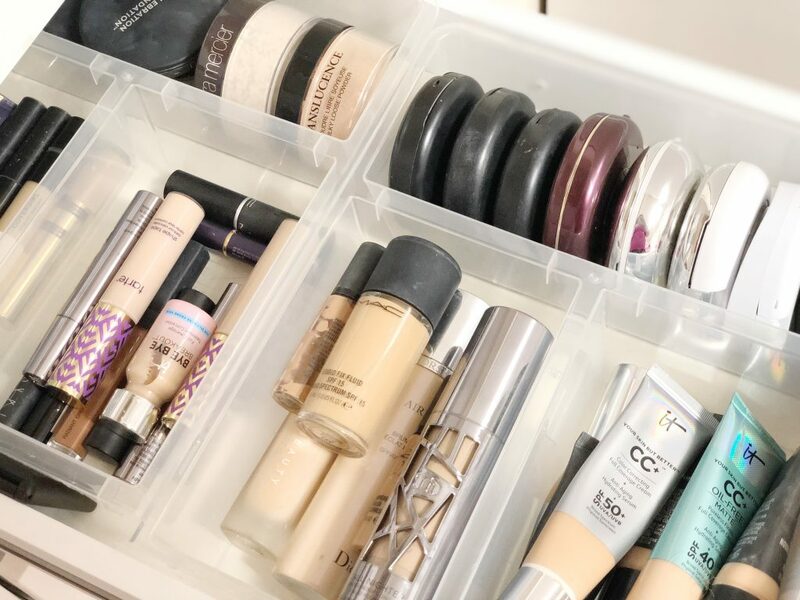 I recently reorganized the drawers in order of the things I use first in my routine for easy access starting with foundation, powder and concealer. Inside the drawers I am using the plastic organizers I found from Ikea but I am also going to link some other great alternatives that will work perfectly for the Alex system or other drawers that you may have at the end of the post. 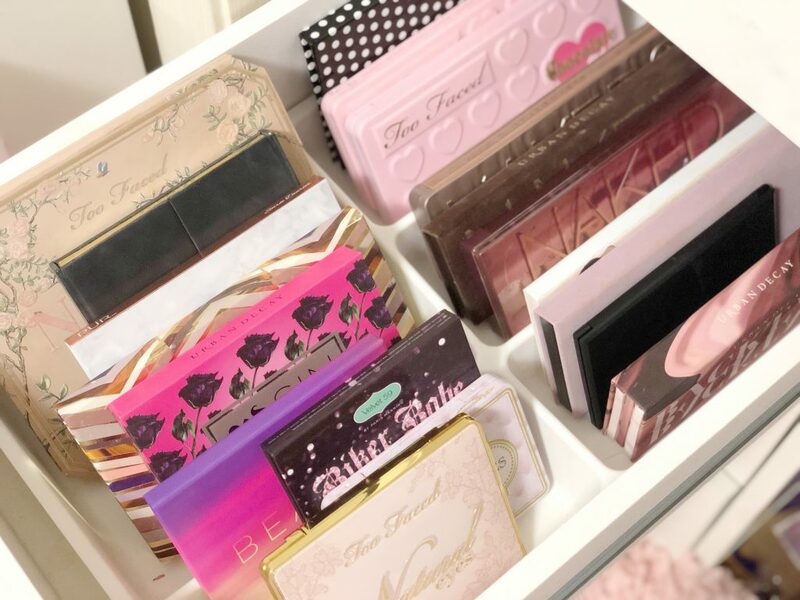 In the next drawer is where I keep all my blush and bronzer since I usually use that next. Same plastic organizers but you can organize it however you’d like. Next is where I keep all my lipstick and glosses. 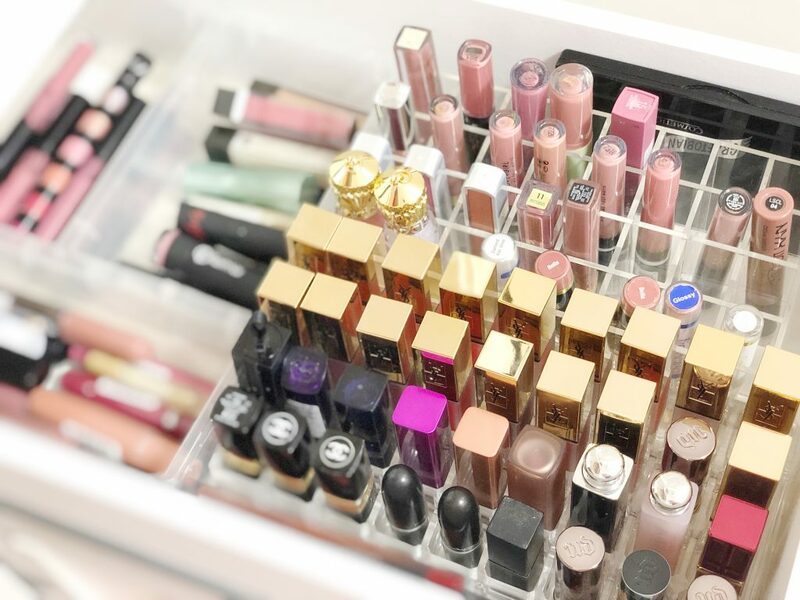 I used one of the ikea organizers I cut in half in the back for ones I don’t use as often and right in the front I keep a tiered stand for lipsticks and a divided acrylic organizer for the glosses I use most. These would also be great if you want to store your lippies on top of your vanity. I just did a huge drawer clean out so I do have some empty spaces. Making room for the new year. Also bear in mind I know there is a lot of product here. I like to rotate items and keep items I want to try out handy. Nexts is eyes and brows and lashes. I use the kitchen utensil organizer I got from Ikea for those. 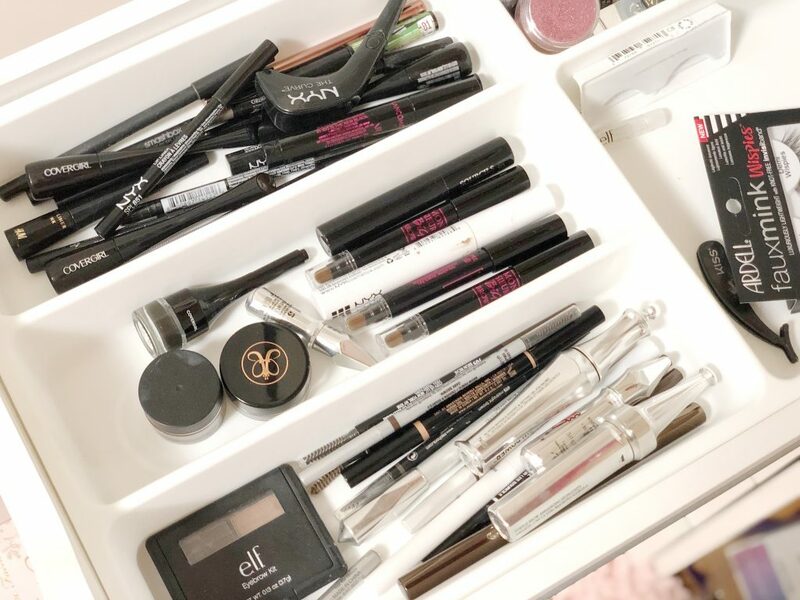 I keep each thing in a separate section: liners, brows and brow fillers and lashes in the back. I keep my mascaras in the drawer below. Also bear in mind that makeup DOES EXPIRE!!!! You CAN clean your makeup and palettes with rubbing alcohol but anything you’ve had for over a year maybe 2 depending on what it is-THROW IT OUT GIRL. It can be hard throwing away stuff that was expensive but if you still have it you probably didn’t use it that much or it’s time to replace it. Do it for your skin. Below that I keep my larger eyeshadow palettes. I keep those upright in the utensil organizer but there are some other organizers I may be trying out. So now here are all of the great storage pieces I found and recommend for inside drawers. These will work for a variety of vanities or however you have things configured just make sure to measure! I’m also going to share how I store my perfume. 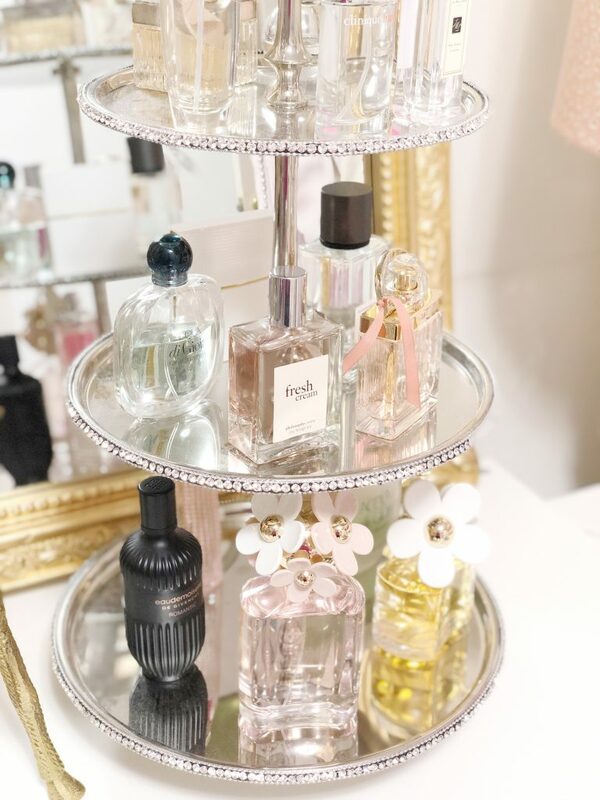 I picked up this cute pastry stand from HOMEGOODS and I keep out the perfumes in my current rotation organized on there. You can get these stands at a variety of places and I recommend bringing your smallest, medium, and largest perfume bottle in your purse when you go to the store to make sure it fits. Also make sure the trays are FLAT or the perfume will fall over. To Start Here are some great vanities. They are an investment. But you will use it often so think of it as a long term purchase that will pay for itself in the end. And here are my recommendations for mirrors if your vanity doesn’t come with one. Mine is from HOMEGOODS. I hope you found some great tips for staying organized! I love sharing with you guys and soon I’ll be doing a tour of my “CLOFFICE” (closet/office) so I can share more organizational tips with you all.